This is supposed to be a members contribution site so as to help other members but I always seem to have a lot of problems getting my contributions accepted. I have always added info direct from my own retail dvd/bluray discs and cases, included front and back screenshots, do my best to make sure there are no typos BUT it has been 9 days anbd no one has even looked at my last two contributions. Both are still marked neither no or yes. Have you stopped taking member contributions for movies that are not in the online database? I am sure they are just running behind... you must remember they see a ton of contributions considering all regions... all localities... all formats (DVDs, BR, 4k). Updates normally take a week or more to get accepted/declined... I personally wouldn't even start to worry at 9 days. Have you stopped taking member contributions for movies that are not in the online database? If these truly are movies that are not in the online database, nobody can vote on them. Updates are the only profiles that will receive yes or no votes. New contributions are only seen by invelos. Your user profile shows that you have 5 accepted profile contributions under your belt - so you have succeeded in the past. The approval process seems to be running normally: contributions have been approved and released every single day this past week. New contributions can't be voted on, they're only evaluated by Invelos, which means they're usually approved quicker than "regular" contributions. 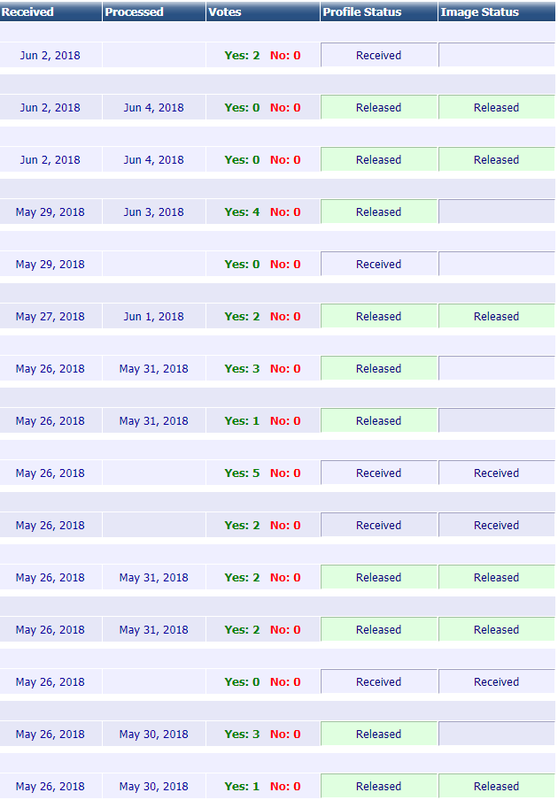 Nine days doesn't fit with neither new contributions (as others have been approved/released in the last nine days), nor with regular contributions (as, again, others have been approved/released in the last nine days). As such, it would seem that your contribution falls into a *third* category, which are contributions that get pushed to "second-level-reviewing". This, for instance, happens automatically when a contribution includes a birth year that isn't yet accepted into the database, and it can happen when a contribution is deemed "controversial" in any way. Second-level-reviewing isn't done on a daily basis or even at regular intervals - it can take a couple of days or a week, but two weeks is no exception, and there have been times that it took a full month. So if your contributions are really pending for nine days, my guess is that they're in that second-level-reviewing queue, and that may take a bit longer. But if that's the case, they *will* be evaluated eventually. This depends on the locality. It does not, no. Those three categories of contributions (new ones, updates to existing profiles, and those subject to "second-level reviewing") are each done in the order they're submitted - it's absolutely not affected by region and/or locality. All contributions, no matter where they come from or for which locality they're intended, are just put in a queue from the moment they reach the Invelos-server, and any time there's any processing going on, those contributions are processed in that same order (within those categories), oldest ones first. All new Profiles are taking up to two weeks to be approved right now, for some reason. The last NEW profiles I did was submitted on May 28th....and approved/released the same day. That might be when I pointed out they were taking too long. They're back to taking too long again now. I pointed it out on the 18th and they started moving again on the 21st. Coincidence? My last new addition took 4 days. So we're getting a bit faster. This is out of the norm for me, but I have a number of contributions which have been skipped the past few weeks. You could argue the couple with zero votes may require additional review/voting time, but these seem excessive based on past experiences. My contribution was for 2 movies that were NOT listed in the online database (I live in New York so would be the United States online database) and were the full and correct contributions direct from my own retail movies and included front & back case cover pictures. I did not include any 'birth years' as the case did not supply that info. I do not profess to be a typist so perhaps there was a typo. Thank you ALL for your responses. Were your contributions declined or are they still pending. Also, which releases are they (what's the UPC numbers)? Just checked under My Contributions again and I see it does show 'released' there now. So I will assume that means they did accept my last two contributions. To check further, I also see they have been added to the online database when one now does a search for them. So, all is good. Again, thanks to all for lending your thought here.